Origin and Habitat: Echinocereus bristolii has a limited distribution in Mexico Soyopa, Sonora, Mexico. Altitude: 250 to 1350 above sea level. Habitat: It grows in the sonoran Desert together in thorn-scrub and semidesert grasslands, mostly on poor, rocky soils in foothill often along with Echinocereus rigidissimus. 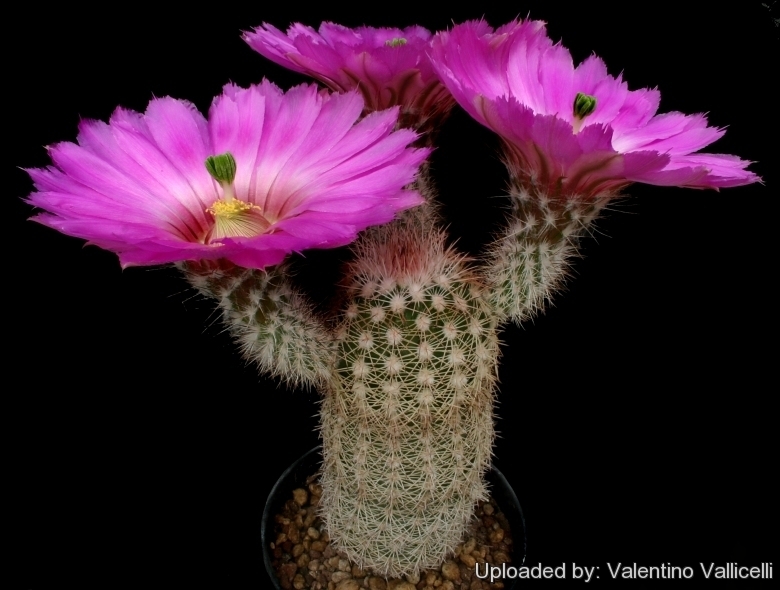 Description: Echinocereus bristolii is a compact species very similar in in its general habit to Echinocereus reichenbachii, but with much larger flowers and somewhat larger stems covered in thin white spines with dark tips. Related species: It has also been considered conspecific with Echinocereus pseudopectinatus a closely related endemic species of adjacent south-eastern Arizona (Cochise County). Habit: Plants solitary at first, later forming clumps of 2 or 3 stems (occasionally of as many as 30 individual stems). Stems: Cylindrical, tapered toward the tips, light green, 10-20(-30?) 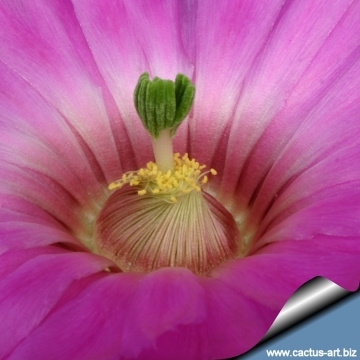 cm long and 5-6 cm in diameter (in cultivation up to 10 cm across), surface totally or partially concealed by spines. Ribs: 15-19(-22), low, acute, somewhat tuberculate. Spines: Whitish or pinkish-white with dark a red tips. Central spines: 1-5 (Usually 3), lower ones longest (8-)10-12(-15) mm long. Radial spines: (7-)15-22(-24), lying against the surface, to 5-10 mm long. Flowers: Large, borne near the stem tips, funnelform, pink, including ovary, 3,8-8,5(-11) cm long, (5,5-)6-10,5(-13) cm in diameter. Receptacular areoles bearing stout spines, perianth parts bright magenta, paler or green near the base. Fruits: Subglobose, somewhat depressed, brownish, opening at the tip. 8) Burquez Montijo, A. & Felger, R.S. 2013. Echinocereus bristolii. In: "IUCN 2013. IUCN Red List of Threatened Species." Version 2013.1. <www.iucnredlist.org>. Downloaded on 27 October 2013. Cultivation and Propagation: E. bristolli is relatively easy to grow and very attractive. Rot easily it is sensitive to overwatering (rot prone), so perfect soil drainage is a must. It prefer a neutral to slightly acidic compost with plenty of extra grit. Best if watered with rain water and given an occasional tonic of sequestrated iron. In the summer they need an airy location in bright sun; well watered when it's hot. To achieve the best spine colours give these plants lots of sun. In the winter light, cool, and absolutely dry conditions. Very cold resistant above approx -12C or less for short periods of time. In mild climate they grow well when planted freely outside in well-drained soil.